FGK’s group kicking clinics are offered as either FUNDAMENTAL or PERFORMANCE sessions. Over the years, I’ve found that students generally fall in one of these two basic groups. Often times, I’ll mix the groups and we’ll do a little of both no matter the age. They either need to learn the fundamentals of kicking and/or punting OR they want to test the skills they have already developed by learning how to kick with some pressure (in front of peers.) I do not publicly rank these sessions to post on the website, this is a learning opportunity among peers and students keep their performance charts to take with them. The goal is to of course to make the kicks during a charting session, but we also want to learn form any that are missed to asses what happened. Kickers watch and learn from EACH OTHER during these sessions as well. Each kicker may ask for very specific advice or technical input when needed during the session. Not sure which session format to attend? Click here to learn more at the bottom of the page! Once you register and prepay for a session, your spot will be secured and registration pages will be close if a session fills to maintain small groups! All group clinic sessions are $80 per student for 1 1/2 hours. Online payment is required prior to a session to confirm a spot. A clinic session credit can be purchased here once you have registered for any specific event. To register before or after online payment, simply click on the event listed under and ‘Upcoming Clinics’ title on this page. Once we receive both your registration information and online payment, you will receive a confirmation email for the session! What Should I Bring to the Kicking/Punting Clinic? We will have some extras of the items below, but it’s best for students to bring equipment they are already comfortable using if at all possible. Please mark all items you don’t accidentally wish to donate with your name in permanent marker. Kicking Block: If you use a kicking block, please remember to bring! Kicking Tee: For kick off sessions, it will be necessary to use a tee you are familiar with. Kicking Holder: Most kickers prefer to kick with familiar holders. Footballs: You may be used to a certain size, but certainly the more we have the better. Should I Sign Up for a Fundamental or Performance Session? These small group (2-6 students) sessions are open for any age. They are slower paced, instructional sessions which really dig into the details of the approach, swing/contact and finish for field goals, kick offs and punts. You’ll see these sessions simply posted as FUNDAMENTAL FG/KO (field goal and kick off focus) or as FUNDAMENTAL Punt (punting focus) open to any age during a single session. Though many students in the fundamental groups can be younger, I’ve worked with plenty of older soccer players who want to learn to kick as late as heading into their senior year in high school. A fundamentals group session is a slower paced learning group designed to break bad habits and reinforce best practices. Many times, this group can include younger beginners who may have never kicked a football before. However, this group can also include soccer players of any age making the transition into the world of kicking footballs. This group can even include kickers with game experience who feel like they were never taught properly from the beginning or perhaps have been struggling with consistency or power. Just as the name implies, I will cover in detail the fundamentals of kicking for this group each session. We will break down the kicking process from A to Z to make sure students understand each and every component that makes up a kick from setup distance/angles, to proper foot contact and body/arm leverage, to consistent and defined finish with each kick. 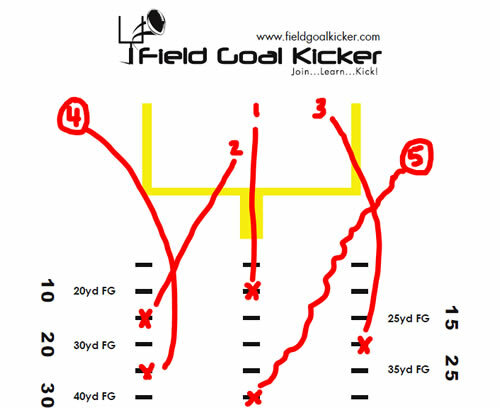 For beginning kickers of any age, this will be an ideal introduction to the fundamentals of kicking field goals. 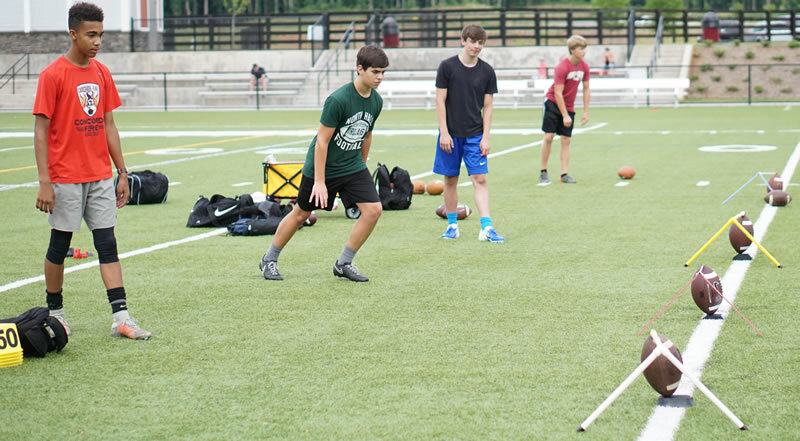 For kickers with some experience who need a refresher on best practices to optimize summer training for next season, we will be breaking down and reviewing all the moving parts that are often overlooked (or that are forgotten). For all kickers in this session, the goal is to break down and learn the parts of a kick so that they can grow their kicking knowledge, kick with confidence, improve consistency and develop greater distance. There will be instructor led demonstrations to illustrate where necessary for certain concepts. Level 1 sessions will be open to juniors, seniors and up. Level 2 sessions will be open to freshmen and sophomores. A performance group session is designed for more experienced kickers to practice competing under pressure among peers. The session will consist of a higher paced group including live holds and charting that students can take home with them. This is NOT A RANKING CAMP as you find elsewhere. In fact, we often say that our group sessions will help prepare students for those showcase type ranking camps. Results are not posted online….this is a learning session. However, performance is reviewed within the group and misses critiqued for the sake of learning to kick when it counts. One of the challenges we all experienced in kicking careers at any level was learning to kick under pressure. Kickers generally practice by themselves in a comfortable “no one is watching” type of atmosphere. The first time a coach is watching or they kick ‘live’ the nerves take over and form breaks down with poor performance. In other words, the coach is not seeing the true capabilities when in a live situation. Kicking “when it counts” (when multiple people are watching) can be improved over time. Students will learn to control emotions by kicking in front of others and by receiving feedback from the coach as well as the group. We can all learn from each other, and this is where the performance group model truly shines. Many kickers seem do well “when no one is watching” but tend to choke as soon as the head coach stands behind them. Why? Many kickers are often simply not used to kicking when they feel tight or nervous because they never get the opportunity to practice under these circumstances. Kicking well on a practice field all along is a great start in a kicking career. However, good kickers are just as comfortable kicking under pressure. Learning to kick well when coaches, parents and peers are all watching is critical to the success of kickers at any level. That’s exactly why the Performance group sessions were designed. These groups give kicking students the opportunity to practice performing under pressure, kicking when people are watching and being charted for accountability. For most kickers, even one or two peers and parents watching them kick can be enough to raise the blood pressure, feel the butterflies and often times cause poor performance. With Performance sessions, we learn to better control performance anxiety, control emotions with basic strategies to help focus and make kicks when they count. We will chart field goal attempts, allowing kickers to rotate through one at a time with live holds while the others are watching. We will work through kicks from various spots and distances, discuss results, review video and learn from each other as a group.